Proper tomato plant care is the key to having success in raising home-grown tomatoes. As for container tomato gardening, contamination from disease pathogens stored in ordinary garden soil are greatly reduced. The good news is, raising wonderful, healthy tomato plants that bear beautiful, flavorful fruit is not rocket science. In fact, if you break it down into steps, solving tomato plant problems is no big deal. Follow each of these links to read more information about how to diagnose what is wrong with your tomato plants, and the easy steps and you can take to make them better again. Use these useful container gardening tips below to get the most out of our tomato growing experience. Have a tip to share? Click here to let us know your successes, or failures, at keeping your tomato plants healthy. The first thing we need to cover in tomato plant care is tomato fertilizer. If you're like me, you want fruit quicker than what the plants usually produce. If you use Bonide Tomato and Blossom Set Spray, you can get fruit up to three weeks earlier than normal. That's what I'm talkin' about! I tool would use The Miracle Grow company knows how to grow tomatoes and any other vegetable or flower! 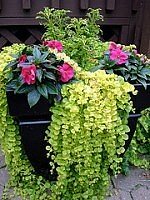 Their products for potted plants and container growing are fabulous. If you did use Miracle Grow Potting Mix for tomato planting as I recommended on the Container Gardening Soil page, this blend contains the Miracle Grow Shake 'N Feed Slow Release Plant Food. Miracle Grow recommends not using any other fertilizer on the plant until after 3 months. Use this, and fresh tomatoes are just around the corner... "Mmm... I can taste them now!" 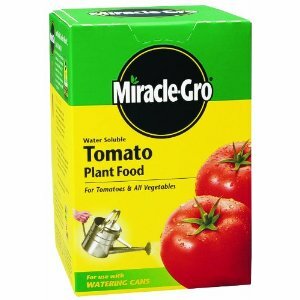 Miracle Grow also makes the same type of water soluble product, but made specifically for tomatoes. Another awesome product to make tomato plant care easier! On average, when applying any water soluble fertilizer, apply directly to the tomato soil around the base of the tomato plant every 7-10 days. Make sure not to apply it over the tomato leaves. A tomato leaf doesn't react well to water sitting on its surface. This can lead to Tomato Blight. I like however, the handiness of the All Purpose Plant Food. 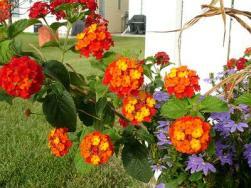 You can use it for vegetables and any other flowers you might be container gardening. 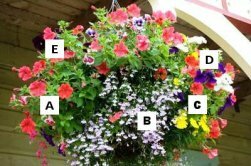 If you used any other type of potting mix, refer to the company's website or labels for specific information on any fertilizer additives, and the recommendations for later fertilizer use. Have a tomato plant care tip to share? Click here to let us know so everybody's tomato growing improves! If you need information on watering tomatoes, click here to go to my page on Watering Tomatoes, where I cover the topic in detail. A frustrating tomato plant care issue is TOO successful plants! My tomato plants grow too well, and they keep falling over. When the fruit gets large, the plant can't support their weight, and the stems break. One great solution to that tomato plant problem is the JWALT DURA-CAGE Superior Tomato Cage. It's really solid, and comes in sizes of up to 4ft tall. The weird circular hoop things actually work really well in practise. It's a little on the expensive side, but if you've spent/wasted countless dollars on bamboo and other tomato plant care "solutions" over the years, this will solve the problems at a stroke. For more help on tomato cages, click here. Next on the discussion of tomato plant care is tomato plant problems, such as tomato disease and tomato pests. Is this tomato leaf curl? Tomato diseases can range from fungal diseases to viral diseases and leaf spotting. A great majority of tomato plants you'll find at your local nursery are extremely disease-resistant. This makes tomato plant care a little easier than the older days. 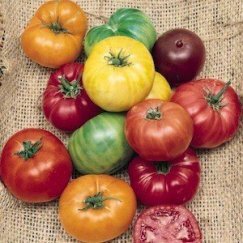 When shopping for plants, especially non-hybrids (known as heirlooms), pay close attention to the "look" of the tomato. Look for any yellowing on existing leaves or yellowing on new leaves. This most likely is a viral-disease contaminated plant. Take note of any spotting. Spots can occur on the top or the under-side of the leaf. Steer clear of any tomato plants that have rings or streaking on the leaf or stem. This too could be stemming from a viral disease or other tomato plant problem. The best tomato plant of the bunch will be one that is short and stocky. And a nice deep green in color. Now to discuss existing container tomato plants at your home. Jobe's Organic Veggie and Tomato Soil lends itself to be extremely sterile and excellent to grow tomatoes. The sterile soil is great for preventing soil-borne fungal diseases which tomato plants are susceptible to. On the other hand, a few things we have to watch for once our plants are growing in our containers are tomato plant diseases, such as tomato blight and tomato blossom-end rot. Tomato wilt can cause absolute devastation to any number of tomato plants. I answer a readers question concerning this horrible disease. Blight disease comes from too much moisture retained on the leaves. This can occur from too much rainfall and also water from sprinkler systems. You usually don't worry about the method used in watering plants outside. But in the world of tomato plant care, don't water over the tomato leaves, rather directly to the soil. The less moisture on the leaves, the better. A tomato plant problem worth mentioning is blossom-end rot. This tomato disease occurs from improper watering. As we discussed on the Watering Tomatoes page, watering too little or too much can have terrible consequences on all tomato varieties. When a plant doesn't receive enough water, the shallow watering forces the plants roots to grow upward in search of nutrients. If your planter is drying out too quickly, a container gardening tip for watering tomato plants is to lightly mulch the plant. This will hold much needed water in the soil: more than what you might think! When a plant receives too much water, the roots are deprived of oxygen. Thus the plant is starved of calcium. If you suspect your tomato plant needs calcium, try this container garden idea. Apply crushed eggshells around the base of the plants' stem. I've never tried this, however I do think it would work. Eggshells would return calcium back to the soil. Have a tip to share? Click here to let us know how you kept the bugs and diseases off of your cherished tomato plants. When doing any normal garden care, we always have to be ready to deal with gardening pests. Since we're dealing with tomato plant care, we'll touch on a few tomato pests that can interrupt our good, gardening day. First, we'll discuss some tomato bugs known as thrips. The thrip is a very small green to brown insect that can be responsible for carrying diseases from one plant to the next. A good way to suspect you have a tomato thrip, is noticing signs of tomato spotted wilt disease. Since you won't be able to see thrips, the symptoms you'll notice are blackened, dead looking spots on the tops of the plants. Streaks of black or a dark color can be noticed running down the stems. How to get rid of thrips? Use a product called Monterey Garden Insect Spray. I highly recommend this spray for thrip control. It only lasts a couple of weeks, but will do the job in a very quick amount of time. For tomato plant care, a dust application might suit your fancy. Shop for a product called Permethrin Dust. Using dust to cure tomato plant problems is a bit messier than a spray. But anyone who has used dust before know the advantages of this choice. You'll always see where the application has taken place. And consistent and even coverage is key for good tomato plant care. Last on my list would be an Insecticidal Soap. Soap works very effectively on pesky tomato plant problems, but will need to be applied at least twice a week if you know you have a thrip problem. Now, on to tomato pests known as the aphid. A common symptom of the aphids would be yellowing leaves and leaf curl. You may also notice stunted plant growth. Noticing a shiny leaf could be a sign of "honeydew". A shiny and sticky excrement left behind by the aphid creates this effect. Not wanting to be a broken record, any of the above mentioned products will very easily work for aphid control. An absolute foliage-eating machine. This little tomato worm will eat everything from leaves to your precious growing fruit. As you can see from the picture under Tomato Problems, Tomato Hornworms are hard to spot. Happy Hunting! You might notice black droppings left behind by this terrible little creature. If you do manage to spot one, you'll notice a green, reddish horn on the "behind" of the animals! You need to pick them off by hand! EASY! EASY! 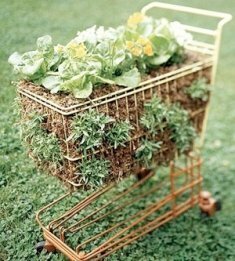 If you don't have the guts to do this, you can treat the plant with a common vegetable insecticide. For existing and future tomato plant care, I would keep some brand names such as Dipel on hand. Have a tip to share? Please let our readers know what YOU recommend to help your tomatoes flourish. Can't find the answer to your tomato plant problem? Check out my NEW Tomato Gardening Pearls Ebook! How much would you pay for perfect tomato growing skills? Click here to find out today's special offer price - it's unbeatable! Follow these links to learn everything you'll need to know to begin growing your own delicious, organic vegetables in containers, right on your patio, balcony, or windowsill! Have A Great Tip On How To Grow Tomatoes? Know a secret tomato-growing tip? Built a great tomato cage? Found an organic way to remove pests, or a method to improve fruit output? Share your story, tip or review about Tomato Growing! Enter the Title of Your Review, Story or Tip. "For example, My Mom's Secret Tomato Growing Tips"
Important Note: The maximum image size accepted is 800x600 pixels. Click on the links below to see some great reviews, stories and tips about Growing Tomatoes. They were all written by other visitors to this page. Tomato Leaf Curl in New Plants?